Fighting Irish Thomas: Swaying from Our Lady? Is Manti's "domed" Mormon mission doomed? Swaying from Our Lady? Is Manti's "domed" Mormon mission doomed? "There is, however, another angle. For many people, Notre Dame symbolized more than just 'the Catholic thing.' It symbolized the need -- in a culture of meaninglessness -- for a champion, for somebody to stand for 'the permanent things.' The Fighting Irish are my team on Saturday, many would say, because Notre Dame means something. When you pulled for Notre Dame, you pulled for a truth...[for] the one place that held fast" --Charles E. Rice, Notre Dame Law Professor Emeritus, from his book What Happened to Notre Dame? "This school, even though it's a Catholic church school, it's created that environment for us to still grow spiritually and still believe the things we do" --Manti Te'o, Notre Dame sophomore linebacker and Mormon missionary. 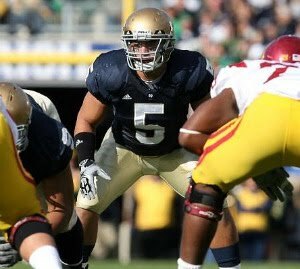 On Sunday August the fifteenth, which happened to be the Feast of the Assumption for those who like to keep track of the ironic, the Chicago Tribune sports page published a feature piece entitled, "Where he belongs," on the faith and football life of Fighting Irish standout Manti Te'o. Although much of the article was typical (for example, the troubles a Hawaiian born-and-bred Polynesian had adjusting to the cold and culture of the Midwest) and even touching (how God changed Manti's mind from attending USC to going to Notre Dame) there was also something deeply disturbing about the article I couldn't initially put my finger on. And then it struck me; while many once came to Notre Dame in hopes their teaching (or playing) would lead others to Our Lady, now not only teachers but even players make the Dome home in order to sway the innocent (if ignorant) away from Her. And the coach, not to mention University president, Rev. John Jenkins C.S.C. (constantly seeking cash? ), doesn't seem to care. Now before you think this commentary is about trashing tolerance or mocking Mormonism, let me say that the Tribune article accurately identifies reasons why Manti is a great fit for Notre Dame and the Irish. Tremendously talented yet extremely humble, a natural leader whose mind is not on wealth and fame but instead thinks in terms of the eternal, Te'o is indeed a "special person" well suited for this "special place." After originally opting to play for Pete "living with a co-ed" Carroll and bask in the "Hollywood glamour" of being a Southern California Trojan, Manti prayed and felt God wanted him to instead attend Notre Dame, and so he reluctantly obeyed--and, after seeing Carroll bolt to the NFL after the NCAA sanctioned his first choice for numerous recruiting violations, he now thanks God every day that he listened. But it's one thing for Te'o to be recruited by Notre Dame; it's another for a Mormon to be doing the recruiting. The Trib article opens with T'eo attending a South Bend Church of Jesus Christ of Latter-Day Saints' Sunday service--with a teammate. It then talks about how Notre Dame introduced Te'o to an LDS representative on his initial campus visit, and you're led to believe how nice it was for a Catholic school to be so accommodating. Reading further, you discover that "Te'o considers it part of his mission to oblige students or teammates who ask about his faith, or appear in need of counsel," which seems like kind of a cool thing for a football captain to do. But when the story then explains that his counseling not only includes calls for bringing "teammates to church with him" (and that the teammate he brought with him was not a fellow Mormon, but Chicago St. Rita alumnus Darius Fleming), you start to wonder. Finally, when "Where he belongs" concludes with the thought that "Te'o wasn't sure if he was doing missionary work well enough at Notre Dame, [until] his father stated 'Son, you're not the one doing the converting. The spirit will'" (and then going back to the beginning of the piece and re-reading that Manti "does not plan for a traditional Mormon mission to interrupt his college career"), the truth hits you harder than a Te'o tackle. Manti is not going on a "traditional Mormon mission" to the uneducated in Africa or South America because the LDS reps figure the charismatic Polynesian has a better chance of converting the uncatechized Catholics in South Bend. Of course many Catholic skeptics and would-be Fighting Irish followers, after reading about this sorry state of affairs, would conclude (with some justification) that Manti's Mormon mission is proof that any hope of the 2010 team playing for Our Lady is over. On the other hand, if you are truly Irish (whether by birth or conversion) you also know there's nothing like a "last straw" to make you want to stand up and fight. The strength of Notre Dame has always resided not merely with its dedicated alumni but with its "Secret Weapon," its die-hard subway alumni, and it's time for them to once again do what they do best; cheer and pray. Pray for the Catholic members of the 2010 Irish, that they have the conviction to play for Our Lady during the contest and the courage to give Her the credit when the contest is over. Perhaps pick out a particular player and write them a letter describing how you and ND's #1 fan (a.k.a. Our Lady) are pulling for them on and off the field. And finally, don't forget about Coach Kelly. Remember, Rockne's conversion to the Catholic faith (which he credited largely to the devout example set by his players) inspired many Irish followers to convert; Kelly's "reversion" from "cafeteria Catholicism" to the real thing could start a similar trend. And, as for you, Manti, I believe that you are a real man, a man truly on a mission. But know that Our Lady is also on a mission, and She would love to have a real royal Polynesian warrior as Her "loyal son," leading Her Irish onward to victory.